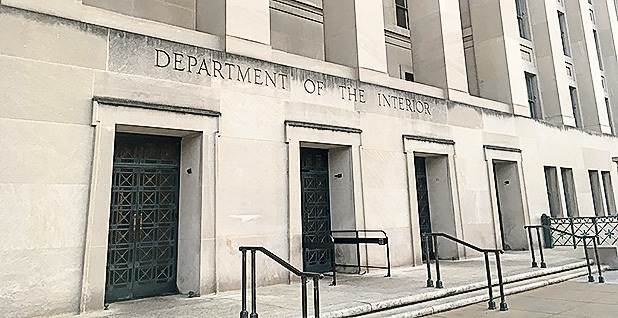 A longtime federal employee who sees "good news" in rising greenhouse gases was tasked early in the Trump administration with retooling the Interior Department's public positions on climate change, according to documents released under the Freedom of Information Act. Indur Goklany, a senior adviser in the Office of Policy Analysis with connections to the Heartland Institute, a libertarian group that promotes the rejection of mainstream science, began volunteering to revise agency webpages and policies right after President Trump's inauguration. His ideas included deleting almost all references to climate change. By May, he was formally assigned to do those tasks. 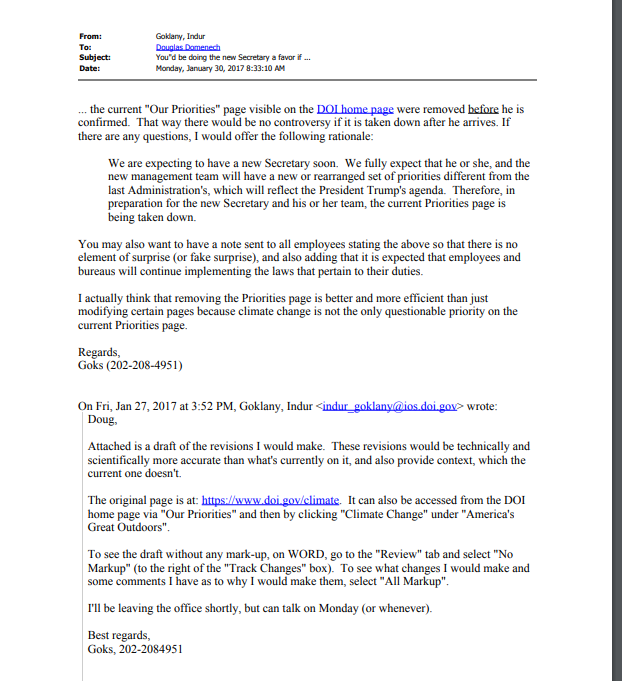 Days after Trump was sworn in, Goklany emailed Doug Domenech, then-head of the Interior Department transition team, with a list of revisions to the main Interior webpage on climate change. He wanted to make it "technically and scientifically more accurate than what's currently on it, and also provide context, which the current one doesn't." The emails were released by Interior in a 1,284-page disclosure prompted by a FOIA request. They reveal that high-level officials undertook detailed efforts to strip climate policy from the agency lexicon, relying heavily on a career employee who has cast doubt on mainstream climate science. Goklany, or "Goks" as he is often called, has a Ph.D. in electrical engineering, according to his biography on Interior's website. He has served in various roles in the Office of Policy Analysis since 1986 and worked at U.S. EPA and, earlier, for the Michigan state government. Goklany is well-known in conservative policy circles, said Myron Ebell, director of the Center for Energy and Environment at the Competitive Enterprise Institute. "If I wanted somebody in the federal government, in the civil service, to review and distinguish the real science from the junk science in the climate area, I doubt there is anyone better ... than Indur to do it," Ebell said. Goklany got the green light in May 2017 to take a detail in the Office of the Deputy Secretary. The move was approved by Associate Deputy Secretary James Cason, who is widely credited with orchestrating many of the policy changes at the agency. Under Cason's direction, Goklany was tasked with looking at the agency's climate change policies, including "reviewing and providing feedback on various documents and reports, including DOI and non-DOI reports, departmental manual chapters, and the information contained on websites," according to a Sept. 18, 2017, document included in the FOIA disclosure. Before the move was made official, documents show, Goklany, Cason and Domenech regularly corresponded on climate-related issues, and the longtime staffer was often called on to find specific documents or share his opinions on science. On April 11, Goklany reviewed a two-page national parks document on climate change at the request of Domenech. "I've looked at it and see several omissions and other shortcomings," Goklany wrote. "[In my opinion], pg. 2 is propaganda for a favored option. I can talk to you about it any time you want." 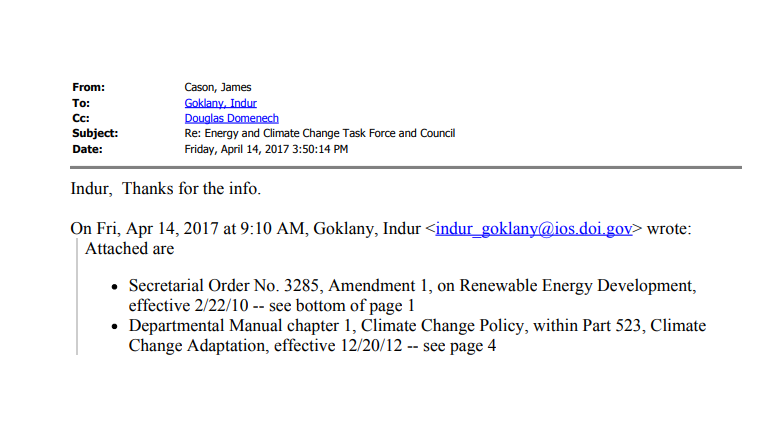 Three days later, Goklany provided both officials with a copy of a 2010 secretarial order on renewable energy development that established an energy and climate change task force. He also attached a chapter of Interior's manual that spells out the agency's climate change policy. The chapter was scrapped in December (Climatewire, Jan. 8). Cason and Goklany also corresponded directly about a scientific paper on climate change that was set to be released by the U.S. Geological Survey. 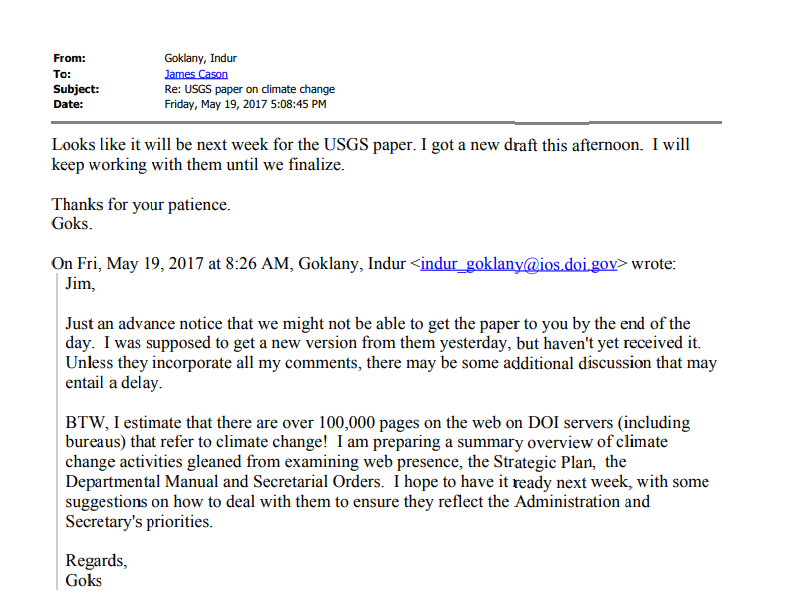 In a May 19, 2017, email exchange, Goklany told Cason the paper was still in the works, and it shows that Goklany was directly involved in drafting the USGS study. "Just an advance notice that we might not be able to get the paper to you by the end of the day," he wrote to Cason. "I was supposed to get a new version from them yesterday, but haven't received it yet. Unless they incorporate all my comments, there may be some additional discussion that may entail a delay." Goklany also told his boss there were an estimated 100,000 pages on the Interior servers related to climate change. On June 9, he emailed Cason and Domenech with an updated draft mission statement and an action list to implement it. In his email, Goklany notes that since the new priorities exclude climate change, he swapped it out with "infrastructure maintenance." Goklany's draft proposed removing all existing webpages that referred to climate change, unless they were related to ongoing science. 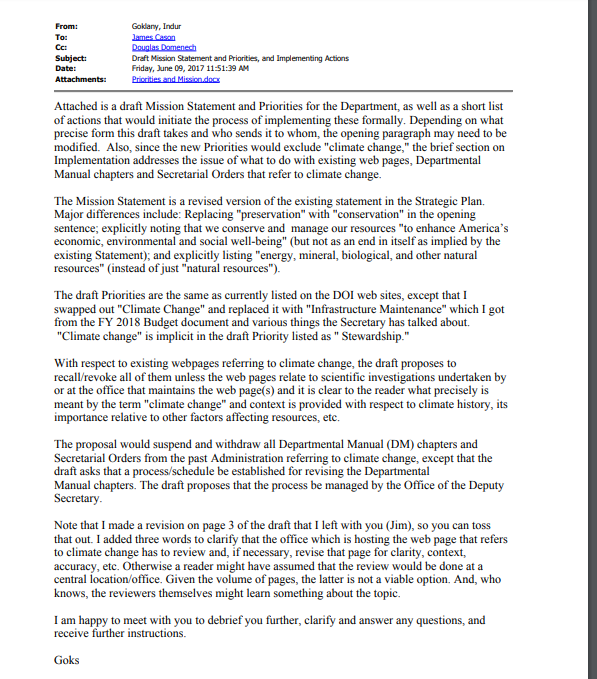 All secretarial orders and chapters in the departmental manual related to climate change should be suspended or withdrawn, he wrote. Goklany's published work wades into territory explored by climate change skeptics. 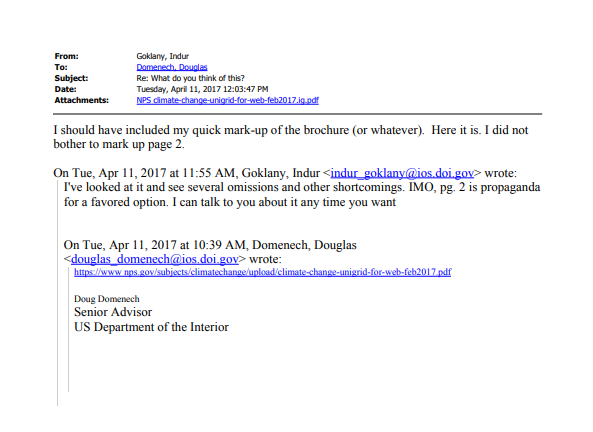 In a March 10, 2017, "pleasure to meet you" email sent to Downey Magallanes, the deputy chief of staff to Interior Secretary Ryan Zinke, Goklany attached two papers he wrote as an "independent scientist." The first, published by the Cato Institute in 2012, makes the case that technologies dependent on cheap fossil fuels allowed humankind to flourish. The second argues that climate change is beneficial. "Carbon Dioxide: The Good News" was published in 2015 by a U.K.-based think tank, the Global Warming Policy Foundation, which was founded by climate denier Nigel Lawson. In the piece, Goklany argues that the rise in CO2 is a boon to the planet because it boosts plant growth and crop yields, improving human well-being. Goklany was often roped into conversations with top Interior brass about studies related to climate change. On May 10, 2017, Domenech flagged a press release issued by the U.S. Geological Survey on a new study showing climate change has reduced the size of nearly 40 glaciers in Montana since 1966. "[W]hat evidence does USGS have that 'The warming climate has dramatically reduced the size of 39 glaciers in Montana since 1966,'" Domenech wrote. "This is the perfect example of them going beyond their wheelhouse." Scott Cameron, special assistant for water and science, chimed in, noting, "They probably are relying on the percentages [but] the more basic point is we need to watch for inflammatory adverbs and adjectives in their press releases." An hour later, Goklany replied, noting that "some context would be useful." He said it's unclear how much of the glacial retreat is due to human-induced warming versus natural variations in precipitation. "I could also make the argument that it's not clear that tourism would necessarily suffer since touring season may expand, and hiking may replace glacier-viewing, but that might be a secondary effect," he added. In another science-related exchange in August, Goklany emailed Domenech a New York Times article on rising sea levels in Guam. 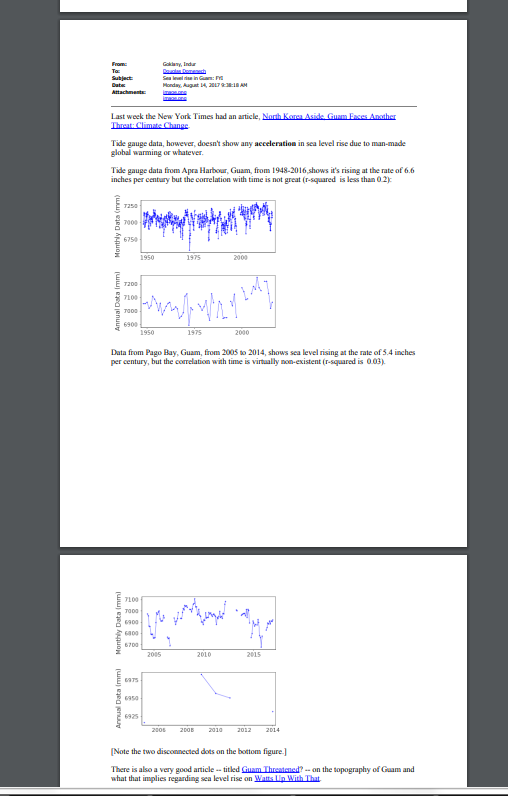 He included multiple charts showing, in his interpretation, that tide gauge data do not show an acceleration of sea-level rise due to "man-made global warming or whatever." 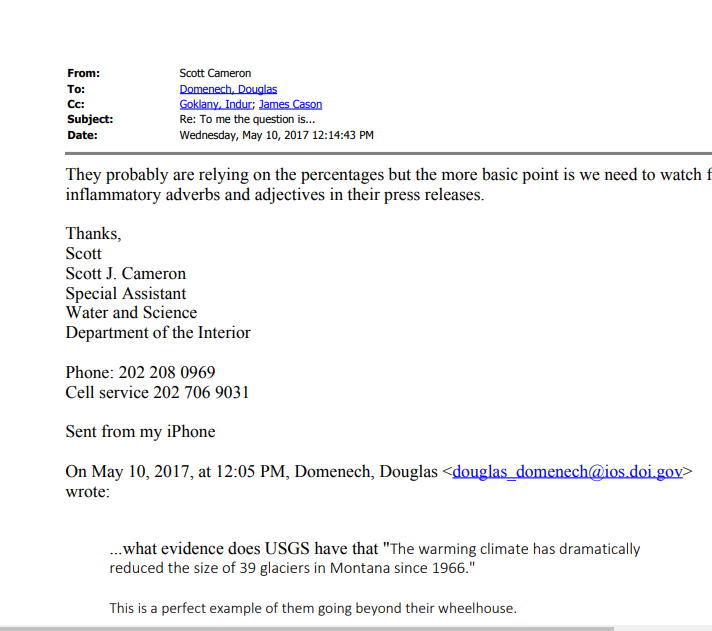 At the end of the email, Goklany referred Domenech — who was then the nominee for assistant secretary of the Interior for insular areas — to a "very good article" on Watts Up With That?, a popular blog for skeptics that's written by radio meteorologist Anthony Watts.